“Soon there will be only two kinds of airliner: Concorde, and all the rest”. So ran the copyline in press adverts during the early 1970s. 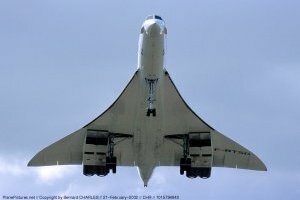 The intention was to draw attention to Concorde’s imminent introduction into service, but thirty years later the prediction still holds true – Concorde is treated differently from all other airliners. Concorde has always been different. It entered service amid huge controversy over rising development costs and possible environmental impact, went on to become the ultimate in prestige trans-Atlantic travel and then arose from a fiery grave to take to the skies once again. The idea of a supersonic airliner was first conceived around the time that Britains’s pioneering Comet jet airliner ran into major problems. By the mid-1950s, military aircraft were routinely able to exceed Mach 1 in a short duration dash, but supersonic passenger travel would require sustained high speed for hours at a time, opening up a whole new set of technical challenges. It was clear that, if the technical issues could be overcome, the result would be a world-beating aircraft which would restore Britain’s lead in airliner design. British aircraft companies began seriously examining the possibilities of a Supersonic Transport (SST) in 1955. To co-ordinate and encourage these project studies a join government-industry committee was formed in November 1956, called STAC (Supersonic Transport Aircraft Committee). STAC initiated the development of a number of aerodynamic research aircraft (BAC 221 and HP.115), and funded some 400 technical papers covering every conceivable aspect of SST design and operation. A final report was issued on 9 March 1959, recommending development of a Mach 1.2 100-seat medium-range (1500 miles) SST and a Mach 1.8 150-seat long-range (3000 miles) variant. A major conclusion was that Mach 2.2 was the upper limit for aircraft with aluminum alloy structure. The Bristol Aircraft Company had been a leading player in developing a workable aircraft configuration for STAC, producing several successive designs under the generic label Type 198. In 1959 further contracts were awarded to continue design studies and by January 1960 the Type 198 had evolved into a shape recognisable as an ancestor of Concorde. It featured a tail-less slender delta wing with a gentle curved leading edge, six engines in two groups of three in nacelles under the wing, and was to carry 136 passengers at Mach 1.8. A comparative study of a Mach 3 version (made of steel to withstand the increased air friction heating) was designated Type 213, but soon dropped as uneconomic. During 1961 a less-ambitious scaled-down version of the latest Type 198 was studied in parallel, under the designation Type 223. This design was a 100-seater with only four engines but otherwise of similar configuration. In the meantime, Sud Aviation in France had been studying a 70/80 seat short-range (1500-1800 miles) Mach 2 SST to replace the Caravelle. Designed for use on European and African routes, the Super Caravelle, as it was known, looked very similar to the Type 223, but lacked a drooping nose. When BAC approached potential joint-venture partners in early 1961, (at government insistence due to the likely cost), Sud Aviation was the only one to give a positive response. The Americans were planning a Mach 3 SST and weren’t interested in BAC’s slower design. The first Anglo-French meeting was held at the June 1961 Paris Air Show, and after a further talks an intergovernment agreement was signed on 29 November 1962. Funding was to be shared equally between the two governments, with the industry partners being BAC and Sud Aviation (later Aerospatiale) for the airframe and Bristol Siddeley (later Rolls-Royce) and SNECMA for the engines. Initially the project was going to comprise two versions of the SST – a short/medium range aircraft and a heavier trans-Atlantic version, but the former was dropped after consultation with potential airline customers showed it to be non-viable. In early 1965 the design was frozen and construction of two prototypes commenced. The industrial workshare was: BAC – nose, tail and engine installations; Sud Aviation (Aerospatiale) – wings, centre fuselage and landing gear. France had a larger airframe share because Britain had a greater share of the engine work – Bristol Siddeley on the Olympus engines and SNECMA on the exhaust system and afterburner. The infrastructure required to support this production effort was huge and included the transport of completed airframe sections between production sites, the construction of numerous full-size test rigs and the introduction of an ‘air bridge’ aircraft shuttling engineers daily between Filton and Toulouse to co-ordinate the development process. There was no precedent for Anglo-French collaboration on a major prestige industrial project, and lessons had to be learnt the hard way. At the same time, the original estimates for the programme costs were proving to be hopelessly optimistic and revised estimates were seriously undermined by the high inflation rates prevalent at the time. 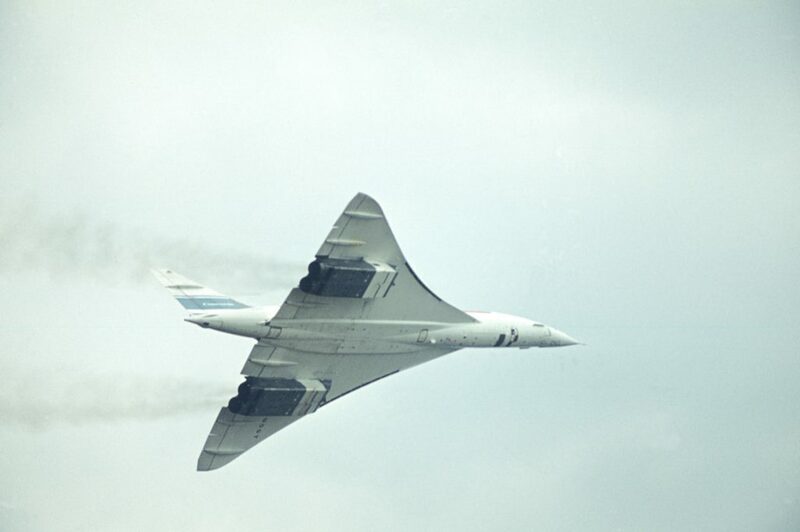 The subtle and graceful external shape of Concorde hides a great many advanced engineering features. The wing is a masterpiece of aerodynamic shaping. The slender delta shape with an ogival (curved) leading edge was only arrived at after a huge amount of wind tunnel testing and reaches optimum efficiency at around Mach 2.2. Most of the fuel is stored in the wings, where it acts as a heat sink for the wing skin during prolonged supersonic flight. Fuel is also used to control the aircraft centre of gravity, to counter-act the rearward shift in the centre of lift as the aircraft goes supersonic. Fuel is pumped into trim tanks in the rear fuselage during acceleration and forward again during deceleration to subsonic speed. Computer controlled variable-area air intakes ensure that each engine receives an optimum air flow under all flight conditions. The nose of the aircraft can be hinged down 17.5 degrees to improve the view of the pilot while landing or taking-off, although in practice only 12.5 degrees is normally used. By 1967, 74 options from 16 airlines had been obtained, including Pan Am and Air Canada. This good start gave great confidence in the future prospects for the project, with potential for 240 sales being forecast by 1978, when the American SST was expected to be available. These options were fully refundable and couldn’t be converted into contracts until guaranteed performance figures had been established by the flight test programme. The first prototype (aircraft 001 F-WTSS) was rolled out at Toulouse on 11 December 1967, but extensive ground testing meant that it didn’t fly until 2 March 1969. The first British aircraft (002 G-BSST) flew a month later. The flight test programme proceeded smoothly without any major problems. In December 1971, the first pre-production aircraft (101) made its maiden flight. The pre-production aircraft featured a much improved visor design, with greater cockpit window area, a longer forward fuselage and extended tail. The flight test programme verified aircraft and systems performance under a very wide range of conditions, and included a substantial amount of work refining the operation of the computer-controlled engine intakes. This was followed by nearly 1000 hours of endurance flying over typical airline routes, using the first three production aircraft (201 to 203). The first airlines to formally place firm orders were British Airways and Air France, who ordered a total of nine aircraft on 28 July 1972. Restrictions had been placed on over-land supersonic routes by various countries due to the expectation that frequent sonic booms would cause damage under the projected flightpath, and this had an adverse affect on potential sales. In fact, during the route proving trials, many complaints of sonic boom problems from affected countries turned out to have more to do with gaining increased access to Heathrow and Paris for national airlines than any actual damage. Vociferous protests over noise and air pollution from politically motivated pressure groups also generated a lot of adverse publicity for Concorde. However, the oil crisis sparked by the ‘Yom Kippur’ war of 1973 had a most devastating affect on sales. The soaring cost of fuel rendered Concorde completely uneconomic for all but state-subsidised airlines. No further orders were achieved and production ceased after 16 production aircraft, with 201 and 202 going into store and the remaining fourteen aircraft being shared equally between British Airways and Air France. Despite protests over noise a trial service did begin to Washington DC in 1976, and when that proved successful a ban on flights to New York was overturned in 1977. Noise measurements of Concorde operations at John F. Kennedy Airport in New York all proved to be within the legal limits. New York soon became the favoured destination for Concorde passengers. After service-entry the maximum take-off weight was raised to 408,000 lb (185,066 kg), and a number of aerodynamic refinements were introduced, comprising a sharper leading edge to the upper portion of the fin, a thinned and lowered engine intake lip, and extending the rudders and elevons aft by 2 inches (0.05 m). This combination gave significant reductions in drag and fuel consumption. 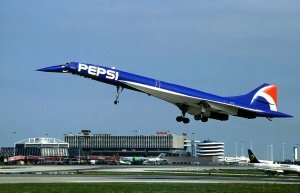 In subsequent years, fuel prices became relatively much cheaper, and the premium-price fares levied for supersonic service allowed a handsome operating profit to be made. In regular service Concorde proved to be very reliable and load factors remained high. In 1984, after prolonged negotiations, British Airways took over financial responsibility for in-service support of Concorde from the British Government, who had previously paid for everything. From 1995, the Concorde fleet was progressively equipped with the TCAS collision avoidance system. Niggling incidents did sometimes occur. On more than one occasion, part of the rudder broke-away in flight, but the aircraft’s handling was not seriously affected. The rudder was replaced by a newer design. Tyre bursts on take-off or landing had been shown to cause minor damage to the wing skin on a number of occasions, but these incidents were regarded as minor. Then, on 25 July 2000, while on its take-off roll from Paris-Charles De Gaulle Airport, Air France Concorde F-BTSC hit a strip of titanium metal dropped onto the runway by a preceding aircraft. The metal strip sliced into the left front tyre of the left mainwheel bogie, which immediately exploded, causing large chunks of rubber to penetrate the lower wing skin at very high speed. The fuel tank in this portion of the wing was ruptured by the force of the impact, causing fuel to stream back along the underside of the wing. At this time number 2 engine lost all power and number 1 engine began behaving erratically. The fuel stream then caught fire. As the aircraft was already too far down the runway to stop, the pilot decided carry on and attempt an emergency landing at nearby Le Bourget Airport. After take-off the landing gear would not retract, and the aircraft could not gain airspeed. The aircraft stalled and crashed at Gonesse less than three minutes later, killing 113 people. An unbreakable rule of airliner safety is ‘No single failure shall cause the loss of the aircraft’. 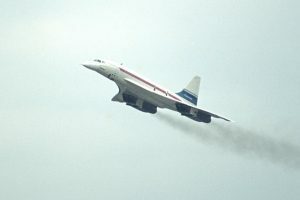 In this case a single tyre burst resulted in a crash, and once a probable cause had been established, all Concordes were immediately grounded. Teams of engineers in Britain and France strived to produce workable solutions that would eliminate the problem but not cripple the operating economics of the airliner. On 5 September 2001 the proposed package of modifications was agreed by the airworthiness authorities. New Michelin-developed Near Zero Growth (NZG) tyres would be fitted, which didn’t explode when punctured, and Kevlar liners were to be installed in each fuel tank to drastically cut the rate of fuel leakage if the wing skin was damaged. The hydraulics for the main landing gear was also protected and potential sources of sparks eliminated. The first modified British Airways aircraft flew on 17 July 2001. On 7 November 2001 British Airways and Air France resumed regular passenger services, with the first Concorde arriving to a very special welcome in New York. The downturn in airline travel after 11 September 2001 slowed down the rate of return to service for the rest of the fleet, but with a new interior trim and plenty of fatigue life remaining the aircraft was still good for several more years yet. 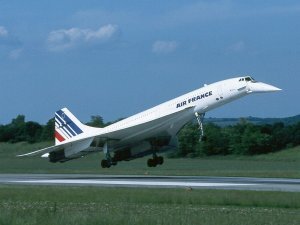 Four Air France and five British Airways Concordes underwent the modification programme. 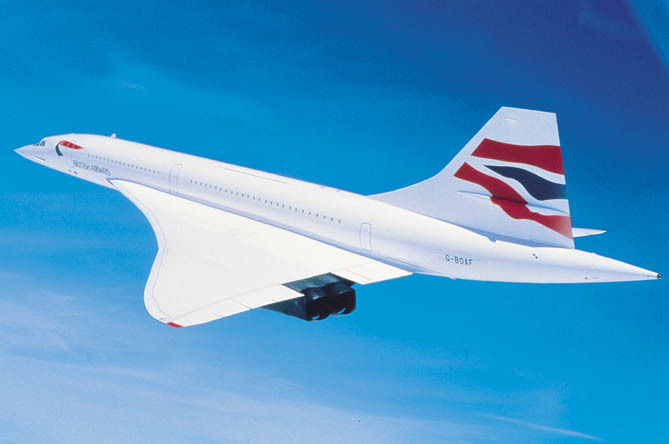 On 10 April 2003, British Airways and Air France simultaneously announced that they would be withdrawing Concorde from service. Since it’s return to service, passenger numbers had not recovered to a sustainable level and the aircraft could no longer made a profit. The drastic decline in transatlantic air travel – Concorde’s only route – after September 2001 meant falling passenger revenue at the same time as support costs had increased. 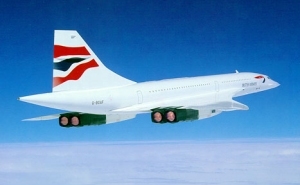 For example, the mandatory fitting of new cockpit security doors would cost ten times as much for the small Concorde fleet as it would for a Boeing aircraft. 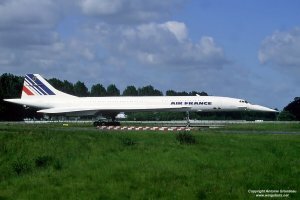 On 31 May 2003 Air France operated its last commercial service in a very low-key manner, and in the following month proceeded to deliver its aircraft to various museums. On 24 October 2003 British Airways celebrated the end of Concorde operations in grand style, with three aircraft landing one after another at Heathrow in front of a large crowd. The last ever Concorde flight occurred on 26 November 2003, when 216 (the last aircraft off the production line) returned to its birthplace in Filton, to be the centrepiece of a planned new Aviation Heritage Museum. 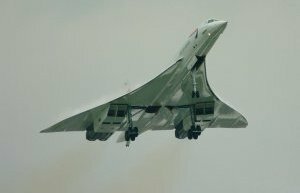 In the end, the real legacy of the Concorde programme is not just a beautiful airliner, but the culture and infrastructure of European technical collaboration which arose from its production. The Concorde factories at Filton and Toulouse became part of the Airbus company, which has now reached parity in airliner sales with the once dominant Boeing. Meanwhile, Concorde is still the world’s only commercial supersonic airliner in service. Bristol Type 198 Series of SST design studies for STAC 1956-1960, evolving from a Mach 1.3 M-wing aircraft to a Mach 2.2 tail-less slender delta with 6 Olympus 591 engines. Bristol Type 213 Mach 3.0 design study by Bristol (1959) with steel structure. Super Caravelle Short/medium range 70-80 seat SST project design by Sud Aviation. Concorde Trans-Atlantic British-led design study of long-haul version with additional fuselage fuel tank. Concorde Medium Range French-led design study of short-haul version with ventral stairway instead of rear fuel tank. Dropped in favour of trans-Atlantic version. Concorde 001/002 First and second prototypes. Shorter fuselage and only small windows in metal nose visor. Olympus 593-1, 2B or 3B engines. Concorde 101/102 Pre-production aircraft with lengthened fuselage, smaller cabin windows and new glazed visor design. Olympus 593-4 or 593 Mk 602 engines. 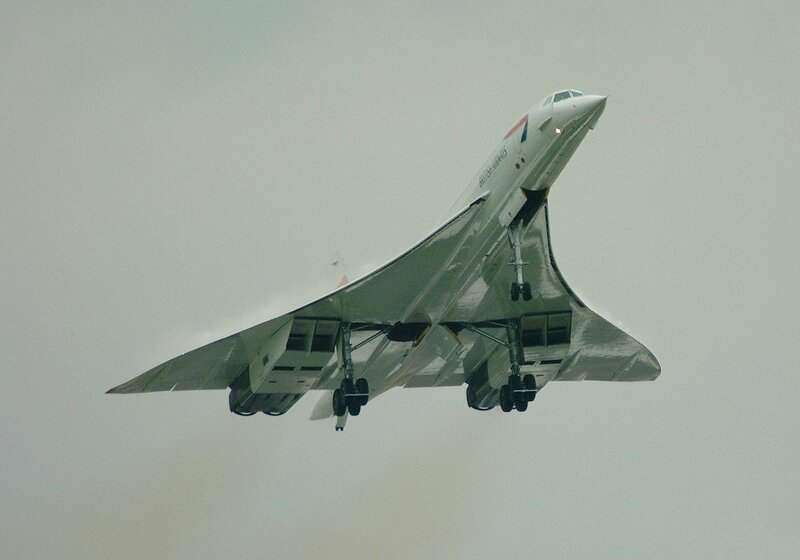 Concorde series 200 Production version with higher gross weight, slightly extended main landing gear legs and improved systems. Olympus 593 Mk 602 or 610 engines. Concorde Freighter Projected freighter version for Federal Express. 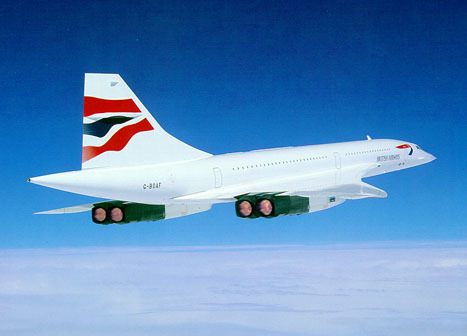 Concorde ‘B’ model Improved production version – planned for introduction from aircraft 17 onwards. Full span leading-edge droop and exended wingtips. Uprated engines with reheat deleted. Not built. 5 November 1956 First meeting of STAC. 9 March 1959 STAC report recommends UK develop long-range supersonic transport. February 1960 Bristol merged into BAC. June 1961 Super Caravelle model displayed at Paris Air Show. 29 November 1962 Anglo-French Agreement signed and initial order placed for 2 prototypes, 2 pre-production examples and 2 test airframes. January 1963 Concord(e) name first used. June 1963 Three key airlines place first order options. early 1965 Short-range Concorde version dropped by the French. May 1965 Pre-production design announced. 11 December 1967 Prototype 001 rolled out at Toulouse. September 1968 Prototype 002 rolled out at Filton. 2 March 1969 Maiden flight of prototype 001 at Toulouse. 9 April 1969 First flight of prototype 002 at Filton. 1 October 1969 001 exceeds Mach 1 for the first time. 1 January 1970 Sud Aviation merged into Aerospatiale. 4 November 1970 001 exceeds Mach 2 for the first time. December 1970 Production version design frozen. 17 December 1971 First pre-production aircraft (101) maiden flight. April 1972 Initial production batch started. 28 July 1972 First firm orders placed by BOAC & Air France. 10 January 1973 Second pre-production aircraft (102) maiden flight. 6 December 1973 First production aircraft (201) maiden flight. January 1974 US airlines cancel their options. July 1974 Agreement to limit production to 16 aircraft already ordered. 21 January 1976 World’s first supersonic passenger services, to Bahrain and Rio de Janeiro. 13 October 1975 French Certificate of Airworthiness granted. 5 December 1975 British Certificate of Airworthiness granted. 19 December 1975 First aircraft delivered to Air France (F-BVFA). 14 January 1976 First aircraft delivered to British Airways (G-BOAA). 24 May 1976 Services to Washington DC begin. April 1977 BAC merged into British Aerospace. 22 November 1977 New York services begin. 20 April 1979 Maiden flight of last production aircraft. 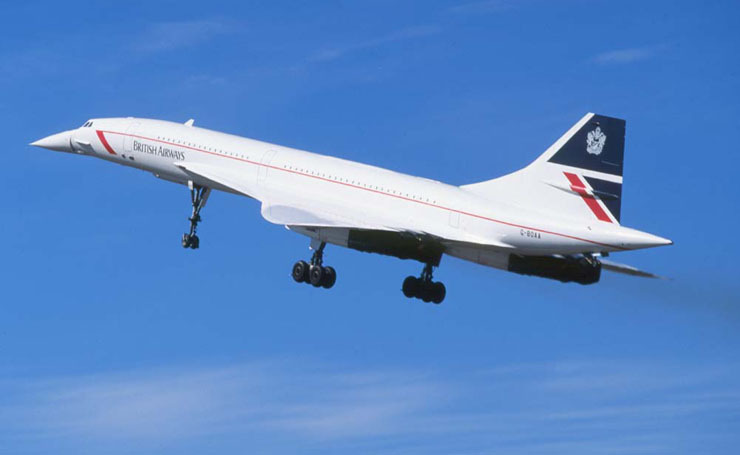 1 April 1984 British Airways buys UK Concorde fleet from the British Government and assumes responsibility for their upkeep. 25 July 2000 Air France flight AF4590 crashes near Paris. Air France fleet grounded. 15 August 2000 British Airways fleet grounded following initial findings of accident investigation. January 2001 Details of return to flight modifications announced. 7 November 2001 Passengers services to New York resumed. 10 April 2003 British Airways and Air France announce withdrawal of Concorde from service. 31 May 2003 Air France operates last commercial services. 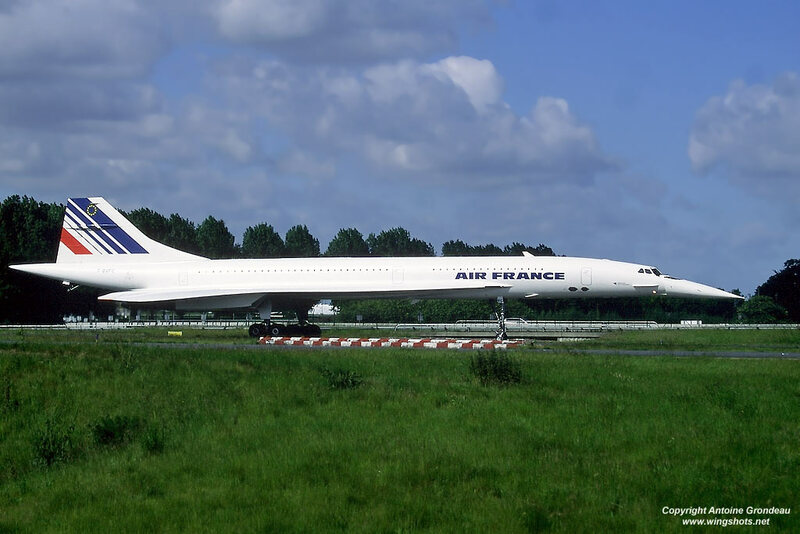 27 June 2003 Last Air France Concorde flight – delivery to a museum. 24 October 2003 British Airways operates last commercial services. 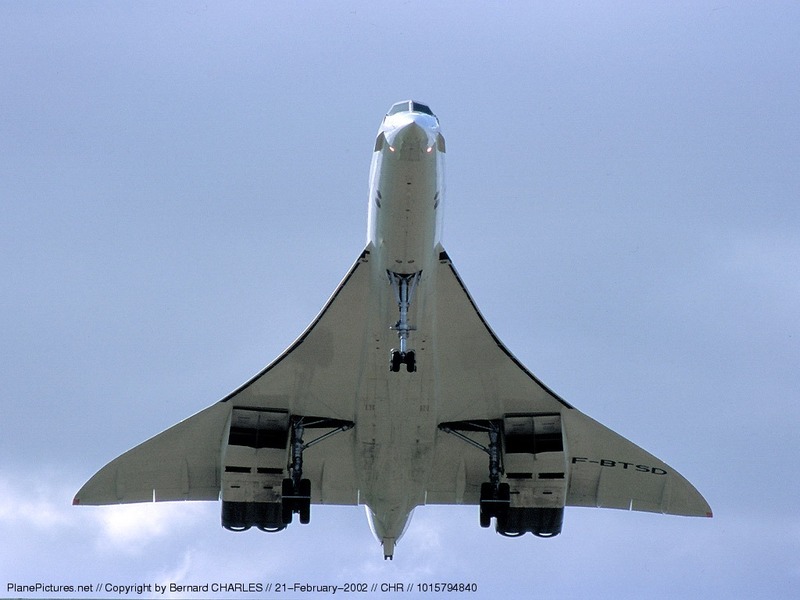 26 November 2003 Last ever Concorde flight – delivery to museum at Filton. Performance: Maximum Speed Mach 2.08 at 51,300 ft (15,635 m); Cruising speed for optimum range Mach 2.02 at 51,300 ft (15,635 m); Maximum rate of climb at sea level 5000 ft/min (1525 m/min); Service ceiling 60,000 ft (18,290 m); Range not known. Performance: Maximum Speed Mach 2.2 at 51,300 ft (15,635 m); Cruising speed for optimum range Mach 2.04 at 51,300 ft (15,635 m) – equivalent to 1,354 mph (2,179 kph); Maximum rate of climb at sea level 5000 ft/min (1525 m/min); Service ceiling 60,000 ft (18,290 m); Range with maximum fuel 4,090 miles (6,582 km) with FAR fuel reserves and payload of 19,500 lb (8,845 kg), range with maximum payload at Mach 2.02 cruise 3,870 miles (6,228 km) with FAR fuel reserves. [An additional two complete airframes where built for static load testing (France) and thermal/fatigue testing (UK-RAE Farnborough), in parallel with the pre-production aircraft]. * Very comprehensive and detailed history. * Authoritative history from the Concorde chief test pilot. * Development and service history. * Well illustrated service history. * Explains the technology that went into Concorde’s design. * Describes a typical Concorde flight. * Includes 60-page feature on Concorde – published just to soon to cover it’s retirement. The Aviation Hobby Shop, UK, 1998 ISBN: ? * Full production and service histories of several jetliners – including Concorde. * Visit G-BOAF at Filton. 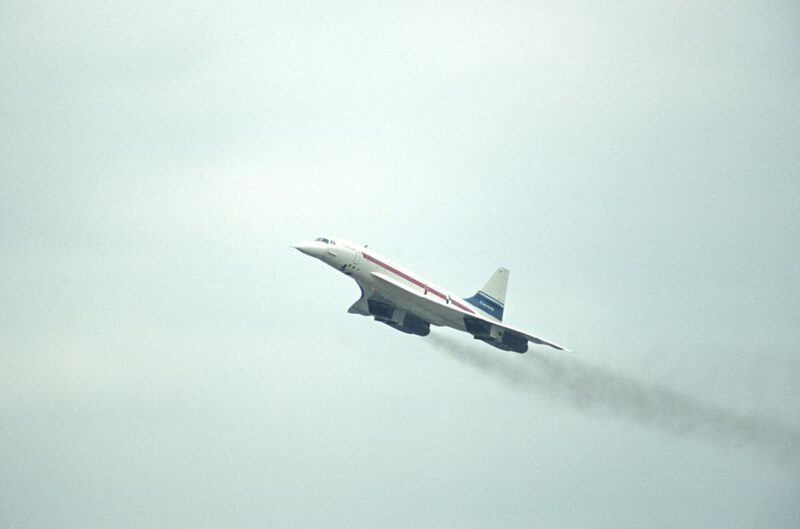 * Video of Concorde’s last flight, returning to Filton in Bristol. * Official Concorde crash report (in English). * Huge website dedicated to every aspect of Concorde. * Enthusiasts website dedicated to Concorde – several pages don’t work yet. * Well illustrated history of Concorde. * French text illustrated report on the status of Concorde in June 1969. * Full coverage of the retirement from service by British Airways. * Another site covering the crash in detail. * Detailed coverage of the events surrounding the crash. * A more recent history of Concorde. * 25 years of Concorde operations. * Profile of the British Airways Concorde fleet. * Concorde operations after the crash. * New profile of Concorde. 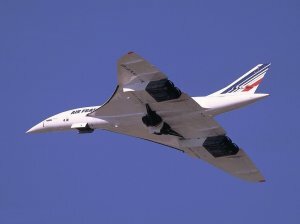 How I wish the concorde would be brought back, she looks very beautiful, it is the most lovely Aircraft I have ever seen! What went wrong, can’t some aeronautical engeneer work something out? just wandering where you got this information from, any refrences would be useful as i am doing a college project on parts of concorde’s development. thanks for this site too, it is very useful. @Umar Mehmood, the Concorde retired because its maintenance was high-priced and because of the Air France flight 4590 Crash near Paris on 25 July 2000. Concorde pleace come back! My favouite plane!